Sam Mink, a third generation Philadelphia restaurateur, grew up shucking oysters in the Sansom Street Oyster House. It was expected that Sam would follow his forbears and remain in the business. But Sam had other things on his mind. He moved to San Francisco to teach elementary school. After a few years, he went to culinary school. While Sam was out West, the restaurant’s owners floundered (pun intended) and closed it down. After almost a decade in California, destiny — and a great business opportunity — called Sam back to Philadelphia. The owner went bankrupt so Sam took over the restaurant, made extensive renovations, and shortened the name to Oyster House. His hard work paid off. 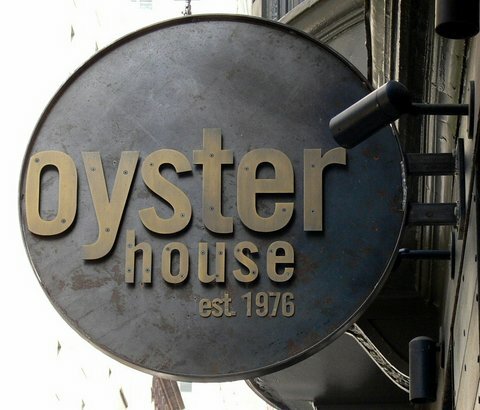 Oyster House is once again the premier place for oysters, shellfish and seafood in Philadelphia. The restaurant offers fresh, seasonal fare, with a California touch. Sam insists on using local ingredients as much as possible. 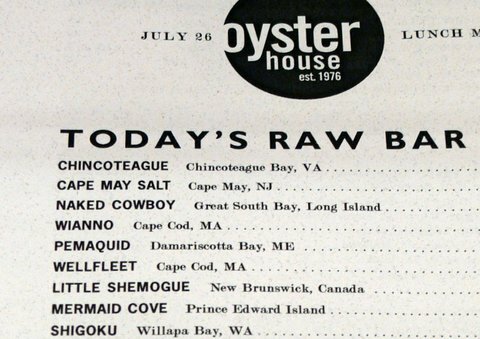 Shortly before 4:00 PM, we found ourselves on the stools at the Oyster House’s marble-topped raw bar. Located in the middle of the restaurant, the raw bar provided us with a perfect vantage point of the 120-seat restaurant’s interior, as well as the action going on behind the raw bar. With a nod to the past, Sam used reclaimed local building materials in the restaurant’s reconstruction. In addition, the white subway tile walls are decorated with dozens of vintage oyster plates that Sam’s family had collected over the years. But we were not there for the decor, or even the incredible selection of seafood. We were there for the oysters. 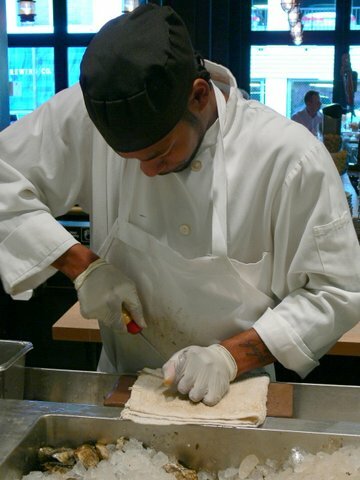 “Oyster shucking is an art,” Sam told me as we watched Ameen Lawrence, a shucker who has spent 17 years at the restaurant, ply his craft with amazing agility and a great smile. 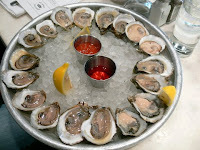 The selections from Samuels and Son Seafood, and Blue Island Shellfish Farms allow Oyster House to offer an impressive and regularly changing daily selection of at least half a dozen oysters. Sam’s oysters hail from along the mid-Atlantic all the way north to New Brunswick. However, in recognition of the time spent in California, Sam includes at least one West Coast oyster in the restaurant’s daily selection. The full-flavored Virginia Chincoteagues were plump, delicate, tender and quite salty at first taste. However, when I let the oyster linger on my tongue, I noticed a slightly sweet buttery finish. New Jersey’s tasty Cape May Salts from the Delaware Bay were plump, firm and succulent, with a distinctively salty, yet sweet, flavor. The earthy East Beach Blondes from Charlestown, Rhode Island, were well balanced. Savory, yet briny, with a slight taste of stone fruit. While I tend to enjoy my oysters naked (the oysters that is, not me), these Blondes fared well with Sam’s mignonette. 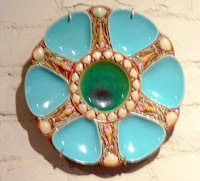 New Brunswick’s Little Shemogues were plump and firm. Although set in a salty liquor, these small oysters offered a sweet finish. Sam’s Malpeques were wild oysters from Prince Edward Island’s Mermaid Cove. 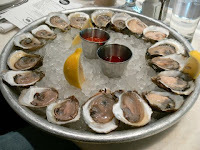 These pretty, medium-size oysters, which were not overly salty, offered a clean finish. 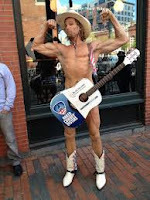 Naked Cowboys, named after the eponymous Times Square fixture who appears to be wearing only a well-placed guitar are wild oysters from Long Island Sound. Naked Cowboys seem to be popping up everywhere these days; but it is more than a fun marketing campaign that has led to their popularity. These chewy, meaty oysters taste of minerals and just a touch of brine. And they give up a uniquely savory finish. The creamy large Salt Ponds from Point Judith Pond in Rhode Island are plump, robust and complex with flavor. Somehow, their intense salinity and distinct minerality gives way to a very sweet-tasting oyster. Sam’s West Coast representatives were the diminutive yet dense Shigoku from Willapa Bay in Washington State. The deep-cupped, firm oysters offer an initial light taste of salt, followed almost immediately by mildly sweet cucumber and melon finish, with a hint of nuttiness. Last, but never least, we sampled Cape Cod’s always reliable Wellfleets. These large farm-raised oysters are meaty and tender, offering a medium to high level of brininess with a distinctly buttery sweet finish. The oysters all paired well with my chilled vodka, but, at Sam’s suggestion, Michael opted for the restaurant’s infamous Mother’s Ruin Punch. Sold by both the glass and the pitcher, the ingredients include a perfect blend of gin, fresh grapefruit, cinnamon tea-infused vermouth, sparkling wine. Fortunately, Michael opted for a glass (or two). 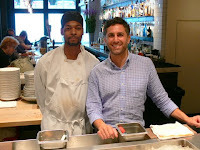 Otherwise, he may not have been able to finish with the photos — or help describing the perfect selection of oysters offered by Sam Mink at Oyster House. Go to Oyster House and tell Sam that Rand from Go Shuck An Oyster sent you. All above photography by Michael Ira Thayer.